I’ve been so excited by so many wines lately that I’ve fallen a bit behind in committing them to 0s and 1s, pixels and screens. That’s a slippery way of excusing myself for failing to post to this-here blog in as timely a fashion as I’d like. Super long finish, oily and full-bodied in classic style, but also quivering and agile. Amazing wine! A couple of weeks ago now, in the Portland Press Herald, I wrote about a winemaker in Alsace who has exploded my notions of Alsace. That’s because Mélanie Pfister is carrying on her family’s wine tradition in the Bas-Rhin, the more northerly outpost of vineyards in this most distinct of France’s wine regions. As Mélanie herself explained to me, the Bas-Rhin compared to the Haut-Rhin is akin to Côte de Nuits as compared to Côte de Beaune, or Cornas as compared to Châteauneuf-du-Pâpe. More mineral, more precision, more finesse and focus. Haut-Rhin has the better known wineries, and I love ’em, those rich, ripe Weinbachs and Zind-Humbrechts. 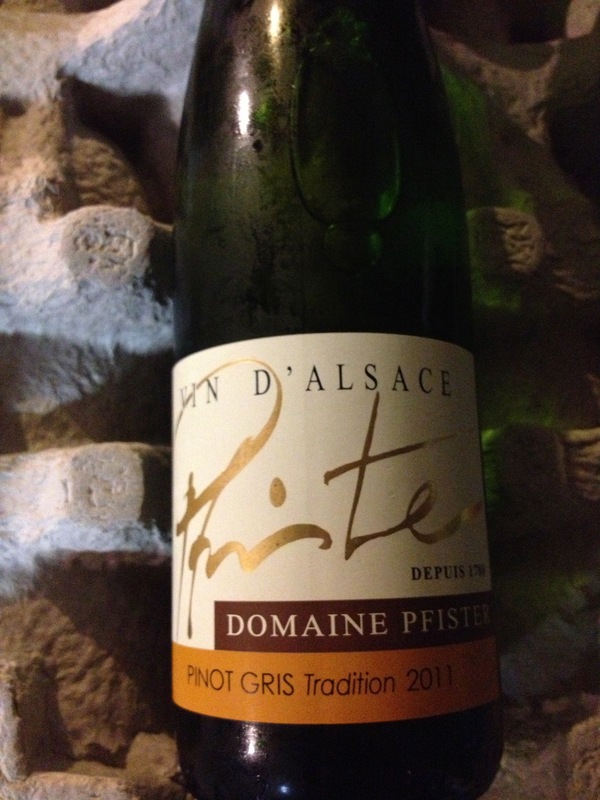 But try Pfister’s wines from the Bas-Rhin if every once in a while you like your wine a little bit more scalpel-like. The column I wrote for today’s Portland Press Herald had a line about New York State’s “Cracker Barrel-like” marketing for the wines of the Finger Lakes. The line got cut during the editing, but I still think that obsolete, 1982-ish, c’mon-down-to-our-Cayuga-and-Riesling-tank approach is partially responsible for the failure of Finger Lakes wines to capture more people’s attention. Another thing that’s partially responsible: there’s a lot of crummy wine from the Finger Lakes. But the quality in the quality-wines sector keeps going up. Which is nowhere more evident than at Ravines Wine Cellars and Hermann Wiemer, two Finger Lakes wineries with impeccable Old-World pedigree and unique, fascinating, delicious wines. It’s mostly about the whites these days — Riesling and Gewürztraminer — but keep any eye out, too, for Cabernet Franc and (maybe) Pinot Noir. The Ravines Riesling is truly, thrillingly dry. Wiemer’s Riesling has a touch of residual sugar (which is why I love it). The Ravines Gewurz is restrained but still exuberant. The three of them would make a spectacular line-up for Thanksgiving. Drinking Riesling always makes me wonder why I’m not always drinking Riesling. At lunch last week at Portland’s first indispensable new restaurant in years, Schulte & Herr, I tasted through a terrific selection of German wines — not just Riesling — that renewed my enthusiasm for how splendidly they accompany seasonal, soulful, lovingly prepared foods of all sorts. And just how damn good they are. Riesling, yes, but also Silvaner and some terrific reds: Pinot Noir, of course, but also Lemberger (what the Austrians call Blaufrankisch). Today’s wine column gets into it. Sparkling wine. Yet another phrase to strike fear into the heart of the average wine consumer, and to strike obstreperous pretension into the mouths of countless wine salespeople and sommeliers. We all whine: Why don’t people drink more bubbles? It’s so hard to get folks to buy Farmer Fizz (grower-made Champagne). Quit-cher-beetchin, dude. The stuff is expensive! And doesn’t usually last well into the next day (actually, it often does…but perception = reality). Anyway, today I write a gentle nudge toward considering sparkling wine for more of your meals, especially for Thanksgiving. What is it about low alcohol, charm, food-flexibility, high acidity merged with subtle sweetness and a generally festive mood that you don’t understand? Actually, forget “understand”; how about like? The focus is on Albert Mann from Alsace, with brief shout-out to Gruet. But the gist is: don’t get caught up in details, just drink effervescent wine! You are currently browsing entries tagged with riesling at soul of wine.